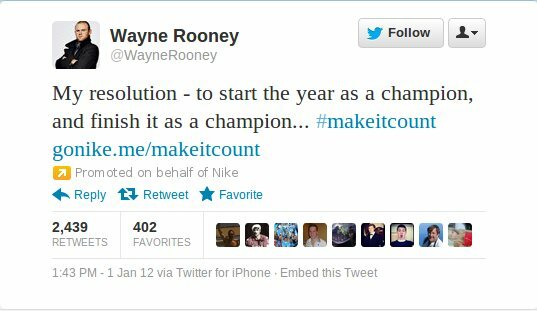 It’s a sign of the times that the UK’s Advertising Standards Authority (ASA) have acted against a Nike advertising campaign that used the Twitter accounts of two premiership football (soccer) players to send out links to Nike content. The issue that the ASA have is that it was not clear to users that the tweets were adverts and have suggested using the hastag #ad in the future to ensure that the were ‘obviously identifiable’ as adverts. Whilst that simple solution may appease the advertising powers that be, I think Twitter are soon to solve the issue for marketers whilst monetising the practice of celebrities/power users/social media-ites “selling” their accounts to be used to send adverts or endorsements Services like adly and sponsoredtweets have been around for some time and offers users with large follower counts the ability to make money in exchange for allowing advertisers to send endorsements on their behalf at any time. Promoted tweets currently display the same account name as the account that posted the tweet and it seems a bit of a waste to display the same account name twice on a tweet, which makes me think that this has to be the next logical step for Twitter to monetise their platform. If it’s not they’re missing a trick as it not only acts as a revenue stream for them but also encourage users to use their platform. Twitter could offer the service along side the regular promoted tweets to allow brand marketers the opportunity to use power accounts and be the first(?) social network that allows power users and celebrities (verified only?) the ability to monetise their online presence (whilst simultaneously selling their soul to the social media devil). Any tweets that have been posted as an endorsement (or an en-dorsey-ment if you will) would have a badge appended to it in the same way as promoted tweets but have copy that implies it is an endorsement on behalf of the brand. @jack, @biz, @dickc – you can have the idea for free – but I want recognition for the use of ‘Endorseyments’. The Kernel ran an interesting piece on the state of the tech recruitment industry last week; one post highlighted some of the more questionable practices of recruiters. One of these ‘scams’ was adjusting candidates CVs which they shouldn’t do without getting the candidates permission, but I can understand why they might. I’ve spent a good portion of time over the last two weeks going over the applications for our open positions at Knowsis. The hiring process is not something I enjoy and something that could have be made easier by the candidates thinking a bit for themselves. Don’t call it cv.pdf (or resume.doc) – you are asking for it to get lost/overwritten at the first step in the process. You may only have one CV on your computer but your prospective employer has hundreds of them on theirs. Make sure at the very least, the filename contains your full name and even better the position you’re applying for. Include one. Tell the employer why you want to work for them, how you found the job, it will make you stand out. You’ll look less like someone who couldn’t be bothered and just fired off their standard CV that they send to everyone. Make sure the covering letter is part of the same file as your CV. Having it as a separate file or only in the original email means it may get misplaced, forgotten about or ignored. As above, if you want to stand out make it look less like a standard CV that you send to everyone and more applicable for the position you are applying for. Make sure the most relevant information that the employer mentioned in the job description is highlighted. Add a page number and your name to the bottom of every page. That way, if a page gets misplaced it’s easier to spot and doesn’t look like you disappeared without a trace for 10 years. It also means if a random page is found it’s easier to know where it came from without having to try and match up based on the formatting. Unless it’s wholly relevant to the job, leave out the interests section. I honestly doubt that there are any employers would be sold on your penchant for ferret racing or samurai sword collecting. Developers, create yourselves a Github account, use it to show some of the interesting things you’ve written or any open source projects you’ve committed to. If you’re working in another digital profession it’s also sensible to have a portfolio of your work available for employers to see. This is just general advice really but make sure that your Facebook profile is only visible to your friends. Prospective employers are now regularly checking Facebook and other social networks to see what their prospective candidates are like in real life and whilst some employers probably wouldn’t hold it against you many others probably will. I rarely get excited about technology these days, in fact I can’t remember the last service that launched which made me say “wow”, but Pult has done just that. 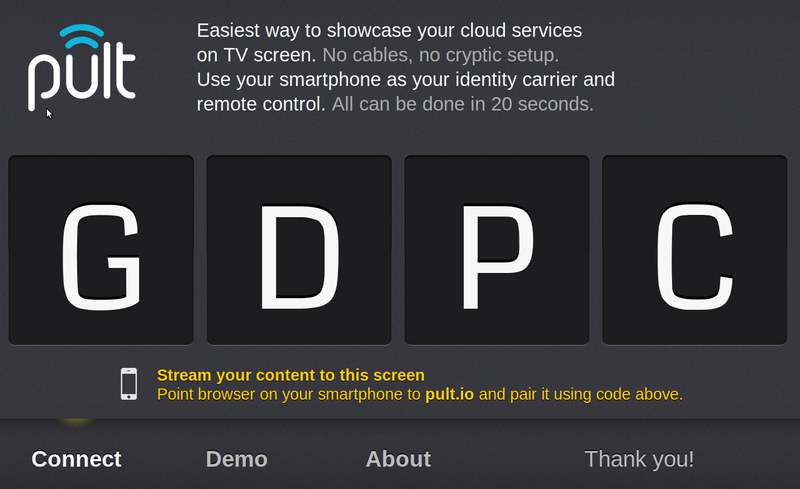 Coming out the recent Seedcamp and based in Tallinn, Estonia, the team at Pult, have created a really simple way to display video on an internet connected screen and then control it using a smart phone all without the need to install any software. At the moment the content available is somewhat limited, but it’s not the content itself that that really interests me here, its the concept and the fact that this is all done in the browser, with no apps to install and no need for devices to support protocols like Apple Airplay or DNLA. Now navigate to pult.io on your smartphone and you are presented with a different screen that allows you input the 4 characters shown on your large screen, via the connect button at the bottom. And that’s it…. your phone is now connected through the magic of the internet to your large screen. So you can chose to display anything from the options presented. It’s just using websockets behind the scenes which in laymans terms means your large screen maintains an open connection to the Pult servers, so when you tell your phone what to play it tells the Pult server and they tell your large screen. UPDATE – My code is actually now AEQT as I closed my browser. I love The Oatmeal and this is another perfect way to sum up my views on movie dowloads.. Locked yourself out of Jenkins? Removed all permissions from your account did you? Save it did you? Feeling a bit stupid? Now restart Jenkins and head over to your admin UI to resecure it quick before the trolls get in. Now restart Jenkins and sit back with a smug grin. In my last post about setting up Jenkins I looked at how to do a basic Jenkins setup on an Ubuntu machine. In my case I set it up on an old machine which is fine when I’m working at home but if I make changes when I’m not at home or when my build machine isn’t running the changes are not built and tested. If you hadn’t worked it out, in a proper continuous integration environment you should be running your builds continuously. So this morning I set out to get an EC2 instance running Jenkins. The other reason I wanted to have the build server running continually is that I need to start scheduling some jobs for Knowsis to do the NLP part of our process., which I could do with Cron, but buildservers liike Jenkins and Teamcity offer really flexible scheduling and a nice interface for feedback so I don’t need to worry about building one myself, for now. The first step in the process is to set up your EC2 instance. Amazon kindly provide a free tier so you can get a free micro instance for a year. This should work for you initially if your builds aren’t overly complex. I won’t run through exactly how to get your instance running as you can find plenty of guides online, if you are completely new to EC2 I would recommend this guide provided by Amazon. One thing to note is that you should make sure you set up the security group for your image to allow all traffic on port 80 so you can actually see Jenkins. In my previous post I mentioned setting up nginx to route requests to Jenkins but didn’t cover it. So we’ll go though it here as we need a webserver running to host the requests coming through. We’ll need to use YUM here as apt-get and aptitude aren’t installed. Thankfully the Amazon package index includes a version of nginx. Once installed we should start the nginx server to make sure that we can see our new EC2 instance before proceeding. In my previous post we used aptitude to install Jenkins but the Amazon Linux AMI doesn’t have the aptitude package manager, s owe have to use YUM instead. I won’t go into the details of nginx setup, but this is the minimum required to get you to a point of having Jenkins working. I’ve just finished watching Breaking Bad seasons 1&2 on Netflix to find that the third season has yet to air in the UK despite the fourth season having already aired in the US and the fifth and final season being due to air later this year, it’s also not available on physical release presumably the studio are waiting for someone to buy the rights to air it on TV before releasing for physical distribution. New Rule: You don't get to moan about copyright laws until I can purchase your content legally as easily as I can buy milk. I’ve spoken about this before, but it still surprises me that the TV and movie studios have yet to realise what the music industry learnt after requiring DRM on their content for so many years (it was around 5 years after the launch of the iTunes store before DRM was dropped across the board). If it’s easier to get the content people will pay for it. It’s 2012, the problem isn’t a technology one, it’s a human one, it sits with lawyers and executives, the kind of people who don’t have a clue what the internet is and think it’s just for ‘geeks’, the same kind of people that wanted to push SOPA and PIPA through. It got me thinking that if the UK’s TV channels weren’t going to license the films or tv shows that some many people want to watch, maybe it could be possible to crowd-fund the licensing of this kind of content in a kickstarter fashion. If a streaming service was set up in such a way that all interested parties could register their commitment to certain TV shows and movies and agree an amount that they would be willing to pay to watch it, maybe we could buy it as a cooperative and then stream it beyond that point. Although the problem here is timing, I imagine it would take much longer to get enough interested parties and then negotiate the license agreements with the studios in which time everyone has got it quicker off of MegaUpload BTJunkie Pirate Bay. I’m interested in hearing people’s thoughts on this idea though.